Creative space for Arts and Culture. News | Views | Reviews | Interviews. Creative expression through texts, sounds and visuals. This is a book you read and savour the richness of the poet’s skilful integration of poetics over and over, poured onto the white pages. The poems are segmented into three sections; The "Images of Memory", "Crossing", and "A Fictional of Farewell". 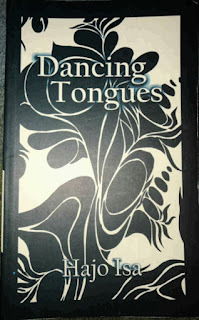 Part One offers normal life occurrences as such while reading one feels the spirited feel of the poems. In Part Two, one is brought into a state of introspection considering the compartments of life's twists and turns. Lastly, Part Three shows the poets personal self realization. So, "A Fictional of Farewell" takes off the veil of convenience for the subject, treading through routes that shapes his/her values and resilience. Discoveries are made and identify affirmed. Love conquering all. Part One, "Images of Memory", takes one into the everyday happenings of life. The first poem in this section, "Flight", simply conjures the scenario of a traveler in the plane, yet the title also readies the reader to a "Flight" into the recess of the Dancing Tongues collection. She personifies the flower to express her thoughts and uniqueness in Flower. "Sitting by a yellow pane/Pressing into the sky/27,000ft of moving distance/Where a deluge of wishes and goodbyes collage/Into a still dialogue/Stifled by throbbing engines". In each stanza, the flower is seen being a source of joy and an observer of the surroundings. "Abuja", projects the common view of the urban city and a peek into the minds of most inhabitants. The former is displayed in, "Tall blocks loom, pointing to the sky/Stuffed offices, lap up the paper trail". While, the latter is depicted in "At the lounge/I listen to shallow talk/Brimming with casual elegance/Speak of our coarse poverty, with indifference". "The Weaver", is a delight to the senses as it beautifully defines the woman's femininity in these lines. "Sitting on dwarf stool/Cheek to thigh/Fingers pick thin strands/Weaving a crown". In, "Traveler" we are shown the maturity of a subject in the terse lines: "I let my voice travel loud and attended/Further than echo/It returns to me full of the outside world/Knowing". The manner a person consciously allows himself or herself to be a medium to become aware of the needs of others. Part Two, "Crossing", I find quite personal to the poets personal growth through the years that cause a state of awakening, a reflection of a soul's journey through diverse moments. They are beautifully relayed using nature as a theme to represent the emotional and mental responses of the persona. "Red Hibiscus", describes the blooming process involved with the hibiscus bud. In lines: "A contended beauty/Pluming in infinite circles/Sown from drinking deep shadows/Of warm soil/Baring your heart to open clouds". Yet, it can be used to represent a person's walk to freedom. We are intimated of the affectionate part of a soul in, "Miles of Nostalgia". The lines: "A soul curled with loneliness/And the feel of your presence roaming unmoored/In my mind’s thoughts" portrays the yearnings of one in love missing the presence of a dear one. In, "There She Is", brings to mind a woman that's happy, owning her power and living her dreams. A vibrant mood is felt in lines such as: "She carries a lifting elegance about her/Her body runs with a camouflage of love/Ideas of fantasy alive in her soul". "Euphoria", is so enchanting as to how felicity is described in the following lines: "Laughing along the byways/Of earth and heaven/Gleaming like a jewel in the sun", to highlight natures elegance. The passionate taste of love is felt in some of the poems that connote the beauty of love and romance, in Part Three, "A Fictional of Farewell". In, "Canticles", the use of repetition, "We stream in colours of day", in each stanza works well to emphasize how love puts us to different channels to project her importance and beauty. "I Think of You", is a heartfelt expression of a subject’s unconditional love and admiration to a dear one. The lines: "Always/I think of you/With joy/A reflection of you on my face I see/Smiling/Standing quietly by my side", are an example. And they may denote missing a dear one that has passed on. In, "On a Field of Grass", we can see two persons sharing their admiration for one another as they lounge to nature’s presence. "The moment is full/A curious dark surrounds us/Steering your thoughts to mine/Our hands coil in embrace/As we press into the field", initiates that. The, "Night Bird", evokes a soul that tries to relates to someone their feelings as uncertainty wraps her decisions yet, undeterred they are. "I am the night bird/Singing love inside you/I am the night bird/Crying words of ash/Voicing rain", depicts that. "Being Human", elegantly harmonizes the poet’s journey in time. In lines: "The sounds of the street draw me/To a place of nowhere/My eyes spin in the light of each day/Living, breathing moments away". A soul living life's diversity through her essence. Part Three, "A Fictional of Farewell", pictures the poet’s coming to a state of deep awareness about realities of life. A knowing that grips her and changes her perception. The progression from each section can be felt via the poems. Conclusively, Hajo's use of brevity is impeccable in Dancing Tongues, as she employs simple words to convey deep messages of beauty, growth, melancholy, rumination, passion and love. Her act of showing us novel imageries can't be missed. She has mastered the skillful use of imagery to depict emotions and thoughts. These bring to the lens of our mind scene after scene of words chosen to display man and nature’s diverse state of existence. The internal rhythms are subtle through the stanzas of the poems, yet when reread the resonance becomes enjoyable. This collection is written using reflective and descriptive poetry.